Gigabyte has this week unveiled a new addition to their range of fanless mini PCs with the unveiling of the Gigabyte BRIX GB-BACE-3000, that can be equipped with a solid state disk (SSD) two provide a low noise mini desktop PC. 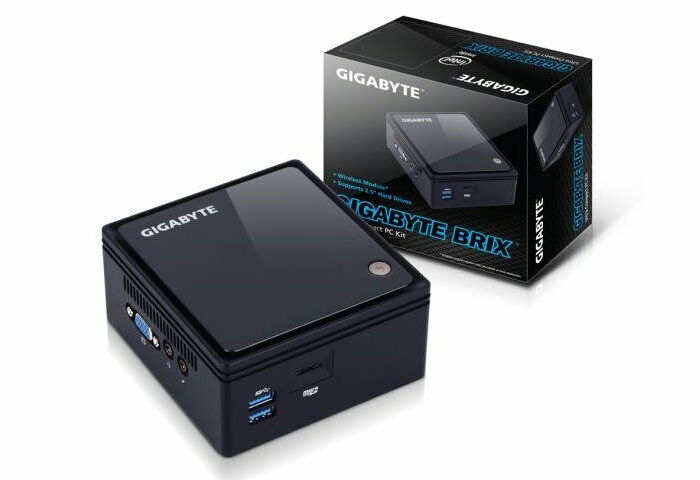 The Gigabyte BRIX GB-BACE-3000 is powered by a Intel Celeron N300 Braswell dual-core processor that only consumes 4 watts of power and can be equipped with up to 8GB of DDR3L-1600 RAM. Challenging the essence of how we define a desktop PC, GIGABYTE engineers have developed an ultra compact PC with a stylish design based high polish surface chassis. Ideal for a broad range of computing applications at home or in the office, the BRIX expounds sheer simplicity and convenience, sets a new standard for desktop miniaturization that makes it perfect as a discreet HTPC / multimedia hub, an ultra-low power PC for the family, an office PC or as a digital signage unit. The BRIX is an ultra compact,versatile DIY PC kit that redefines the desktop PC in terms of miniaturization with a form factor that is small enough (56mm x 107mm x 114mm) to sit in the palm of your hand. Other features of the Gigabyte BRIX mini PC include 802.11ac dual-band WiFi, Bluetooth 4.0, and Gigabit Ethernet connectivity. Unfortunately no information on pricing or worldwide availability has been released as yet, by Gigabyte but as soon as more information comes to light we will keep you updated as always.